A few months back I started a weight loss program. Exercise and I have never really been the best of friends, but I am trying to do better. 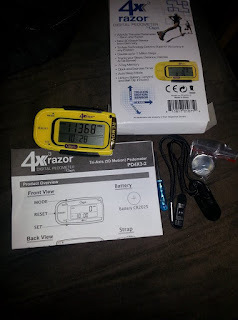 So I was pleased as punch to be able to try out the Ozeri 4x3 razor Digital Pocket 3D Pedometer with Bosch Tri-Axis Technology. This pedometer has a high-tech look and feel, but it is very easy to set up and get started. It comes wth everything you need to get started including two batteries, one to use now and a replacement. It also has a belt clip and a removable lanyard, great for me because I would rather wear it on my wrist. It has a 7-day memory so it is easy to go back and compare your steps. It is very user-friendly I highly recommend to anyone that is trying to live a healthier lifestyle and would like to start walking or running and tracking the amount of steps they take. It has really helped me with upping the distance of my daily walks and shedding 28 pounds so far. Introducing the 4x3razor Digital Pedometer by Ozeri - the world's thinnest and most advanced 3D Tri-Axis pedometer. Unlike traditional pedometers that do not work accurately unless secured vertically, the 4x3razor utilizes a new advanced 3D Bosch sensor from Germany with Tri-Axis technology that provides superior accuracy in any position, whether up, down, flat, on its side, or at any angle. The 4x3razor's Bosch Sensor is a digital accelerometer which is far more accurate than mechanical sensors used in other pedometers. Compact, sleek and razor thin, the 4x3razor Digital Pedometer is only 0.5cm (less than 0.2") thick and weighs just half an ounce to fit into the tightest pocket, but also includes a detachable lanyard and belt clip for the ultimate convenience. A personal trainer par excellence, the 4x3razor is a 2nd generation pedometer used by professional 100 mile ultra runners such as Evan Kimber to accurately record steps, distance, calories consumed, fat burned and time spent exercising. This advanced Digital Pedometer filters out vibrations and only begins counting after it detects a sequence of continuous steps for greater accuracy. The 4x3razor Digital Pedometer ships with an installed and extra Lithium battery, a belt clip and detachable lanyard and instruction manual. Your satisfaction is 100% guaranteed. New 3D Tri-Axis Bosch Sensor from Germany (with X, Y, Z vector detection) provides superior accuracy in any position. Designed for high-performance athletes, the 4x3razor is the world's thinnest and lightest pedometer -- 0.5cm (less than 0.2") thick and weighs just half an ounce. Records steps, distance, calories, fat burned and exercise time with the most advanced Tri-Axis technology. Counts up to 1 million steps with 7-Day Memory, and includes a built-in Clock and Sports Timer with Auto Sleep technology.